Think about the last time you received an unexpected and totally delightful gift. That’s just how I felt when I heard the music of Sweet Wednesday. You’ll forgive the gushing when you hear the alt-country, folk, roots sound of the Boston-based duo known individually as Dave Falk and Lisa Housman. I didn’t think musicians made music this addictive anymore. Not since Joan Baez, Glen Campbell (courtesy of Jimmy Webb songs) and Joni Mitchell, anyway. Still it was something of a surprise for Housman when she met Falk about twelve years ago and soon found herself collaborating with him. For one thing, Falk was a rock and blues guy and Housman was a folk fan. Perhaps that’s why the songs the two perform as an acoustic duo have so many influences, though it’s often Housman’s clear, emotive vocals that steers the music—and steals the show. That’s no small feat when you consider Falk plays guitar, mandolin, harmonica, banjo and violin and Lisa plays guitar—all beautifully I might add. Their playing is such that they could certainly enjoy success if they played nothing but instrumentals. Lucky for listeners the two haven’t gone that route, preferring instead to develop songs with hearty vocals and lilting harmonies. The two are true road warriors, in the US and Europe, and have also won a host of prestigious songwriting awards. Now that the two are looking toward their May release of their latest album Escaping from the Pale Moonlight, that’s not likely to change anytime soon. And that’s just the way the duo want it. “With music, it’s important to love every aspect of what you do,” said Housman. Prepare to have the duo’s music do the same to your soul, especially with the songs on this latest album that are full of the type of imagery that can only be likened to a Joan Baez or Leonard Cohen song—really, that rich and magical. With a description like that during a casual conversation, you can imagine the power of Sweet Wednesday’s music. But don’t imagine. Go to the group’s website to hear and buy the music as well as find tour dates. On a national tour, they are performing to rave revues. Audiences love their shows and so will you... The two Singer/songwriters, Lisa Housman and Dave Falk, make an exciting Duo... Their folk/rock style has been compared to Bob Dylan and Woodie Guthrie... I highly recommend that you get there early just to make sure, you get a good seat. . . Enjoy! "Escaping from the Pale Moonlight" is a top of the line album by sweet wednesday... a "must buy" album. "Whether they're breaking your heart or making you laugh out loud, discover why audiences all over the country are falling in love with Sweet Wednesday. Great musicianship and terrific writing make Sweet Wednesday's national tour the one everyone is talking about." A rare breed of individuals reminiscent of the best of the 1960s and '70s peace and love era and their music is a true reflection of that. If Natalie Merchant and Neil Young were to form a band, the result wouldn’t be distant from Sweet Wednesday’s harmonious mélange of folk, country, and roots rock. Name-dropping such iconic figures may seem like hyperbole in describing a fairly young and rather unknown duo from the Boston music scene; however, Sweet Wednesday’s emotionally stirring and poetic narratives on Escaping from the Pale Moonlight lend credibility to such a startling comparison. Comprised of singer/songwriters Lisa Housman and Dave Falk, both of whom also play guitar, Sweet Wednesday approach their lyrics with a literary perspective that is often lost in the stream-of-consciousness trends damaging the indie flock. Actually, Sweet Wednesday are indie in status only; their tunes are closer in style and spirit to early ’70s singer/songwriter balladry and country rock than anything charting on college radio at the moment. On the opening cut, “Days Grow Long,” Housman truly recalls Merchant in her 10,000 Maniacs prime; however, Housman’s voice is more deep and husky, and it absolutely soars during the chorus. Furthermore, Merchant’s words were never as quirky as this as Housman seems to be singing about vampires - or perhaps werewolves - in love (“When the moon is full and takes an orange glow/That’s where our souls ignite”). Housman and Falk display an irresistible chemistry; their voices blend together effortlessly, especially on “Southern Drawl” and “Open Up the Blind,” wherein the two glide breezily over a locomotive beat. Alone they deliver knockouts, too. “I Still Love You” finds Falk at his most fragile and tender; the track’s intimate acoustic arrangement unveils the wounded longing in his voice. When the duo’s sparkling folk, rock, roots sound catches more ears, it’ll be tough to contain...There’s a twangy, alt-country vibe flowing through “Castle in the Sun,” yet other tracks such as “Curious Eyes” have that dusty, gritty pain of John Hiatt. Then you have sweet folk mixed with Americana – think Joan Baez or Buffy Saint Marie – on “Desert Flowers on Route 66.” The musicianship and arrangements are just hearty enough to fill a listener with wonder but open enough that they don’t overwhelm the storytelling of the lyrics. No matter the song or main format, Sweet Wednesday’s music sparkles. To catch more of those sparkles, follow the twinkling path into the band's website. It was a great pleasure to have Sweet Wednesday—Lisa, Dave, & their band—perform for us last week. Their original compositions channel deep traditions while breaking new ground. They were very easy to work with and I look forward to future collaborations. Did I mention their singing? Taking turns on lead vocals and supportive harmonies, they have an absolutely wonderful, transcendent quality that is perfect for a warm summer evening. Despite their delicate Southern pop, the Yanks of Sweet Wednesday don't sound like frauds at all. They don't even sound like East Coast poseurs. Their lovely tunes actually sound more like misty California mysticism. The duo isn't another Fleetwood Mac throwback, though. Even their jaunty departures sound more like carefully disciplined music geekery influenced by UK psychedelia. When you look at the cover of Wherever You Go, a CD by Sweet Wednesday, you'd expect some classical music. Well, it's not. The CD does give you that feeling of a live record though. You almost get the feeling that you're sitting on songwriters Dave Falk and Lisa Housman's porch in a wooden rocking chair, overlooking the cornfields while the artists play their favourite songs especially for you, and they're playing it something fierce, and with enthusiasm! Dave Falk plays the guitar and harmonica and Lisa Housman plays the guitar, mandolin and kazoo. Both of them sing. They've written all of the songs themselves. Their songs tell us about all the possible places and situations between Half Moon Bay, CA and Winter Hill, MA. We're dealing here with true musicians. They sing together and play together in a way that shows that they're something special together. Love radiates so to speak, and I don't just mean the love for making music! There's something magical going on. The two of them are playing so intensely together, and complete each others performances so wonderfully that you get all giddy. The performance is purely acoustic, and it's a brilliant mix between folk and rock. You can really see that theyre having fun playing their music together, and because they're both really good, it's just something special. It's not only so very breathtakingly pretty when they're performing together, their solo-acts are wonderful as well. Everything is in function of the song, without trying to be dramatic, and they touch you right in the heart. Lisa's songs are very strong, and Dave's are just as good, and the same goes for the songs they've written together. On top of that, there are some other local musicians from the Boston scène on this wonderful CD, for instance members of the Swinging Steaks like Andy Plaisted, Paul Kochanski, Jamie Walker, Steve Sadler and Jim Gabino. Other contributions are by Steve Mayone on lap steel, mandolin and lead guitar, and we can hear Seth Connelly on guitar, mandolin and bass. Vital roots-music of the very best kind!!! Sweet Wednesday is driven by the duo of Lisa Housman on vocals and guitar, and Dave Falk on vocals, guitar and harmonica. They share lead vocal responsibility from song to song while exhibiting a folky, Bob Dylan/Woody Guthrie edge to their delivery. Lisa Housman's vocals run the gamut from sweet and airy to cynical and sassy while Dave Falk's voice is melodic, concise and strong. Collectively they paint a colorful tapestry of mellow sounds filled with vivid imagery from track to track. Guest musicians on Wherever You Go include the Swinging Steaks: Andy Plaisted, Paul Kochanski, Jim Gambino, Jamie Walker and Steve Sadler as well as Steve Mayone on guitar, lapsteel, mandolin and bass and the multi-talents of Seth Connelly on guitar, mandolin, bass, and percussion. Beautifully produced, engineered and mixed by Rob Ignazio at Porter Square Studio in Somerville, Ignazio did a fine job of harnessing the subtleties of Sweet Wednesday's music. Seth Connelly also assisted with recording duties at his Humming Lake Studio in Brookline New Hampshire. With a folky charm, expect Sweet Wednesday to make a lot of new friends and fans with the release of their excellent offering Wherever You Go. Good stuff. "The lyrics are clever and fun, conversational and just like that thing you wish you'd said but didn't think of in time." "These are some of the most poetic lyrics I've heard put to music in quite some time." "How Can I Know" you guys aren't really world-famous folksingers in disguise? This is great stuff! Terrific lyrics, mighty fine guitar playing, and exquisite singing - all mixed with a tremendous dose of confident attitude. ENCORE! Smart, funny and innovative music from two of the best. You will love Sweet Wednesday. Sweet Wednesday tell the best stories. In "(Lisa, I'm Sorry I Brought You to) New York City," we are regaled with a story about running out of gas while driving to New York from New Jersey. At one point, the drivers receive a parking ticket because they have stalled on the bridge without gas. Considering the man sings it and the female of the duet is named Lisa, it makes one wonder when they play live whether he sings to her. If any of Max Barry's books actually get made into a movie like he swears they will, then the title track belongs on the soundtrack. Barry's books tend to have a certain style about them, and this song touches on it perfectly. Lisa Housman and Dave Falk are, in essence, singing storytellers. Through travels, life lessons, childhood reflections, and songs of love, Wherever You Go takes listeners on a journey with two singer/songwriters who write about their own lives. The opener, "Mid-Morning Rain," has an upbeat, tap-your-feet melody as Housman's voice sings in a matter-of-fact tone similar to Dar Williams. Her soprano notes sing a tender chorus of poetic lyrics. The traveling songs move from "Going Over Brooklyn," "Pacific Shores," "San Francisco," and back to "Winter Hill." The narrative lyrics range from comical statements: "My hair still looks like crap / From this morning when I didn't have time to brush it;" to heartfelt: "And I felt sand between my toes in San Francisco / And I touched the ocean and the ocean tasted me." 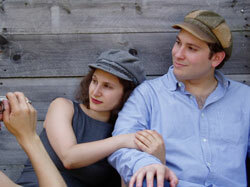 This folk-rock/alt-country duo writes straightforward tales in rhythm that grab the listener's attention... Wherever You Go shows off very diverse displays of songwriting. Housman and Falk are talented singer/songwriters who, without taking themselves too seriously, are simply writing through the natural wavering of human emotion. Sweet Wednesday is a pair of singer-songwriters, Dave Falk and Lisa Housman, who play in what they call the “modern folk” vein, and they do it damn well. provoking…young, fresh, energetic and empathetic tunes that reflect their personalities." and new..Rarely have I encountered such incredible talent.."
playing, it seemed as though he had known me ." Breaks All the Rules is an entertaining disk worthy of many spins." Housman, Falk could really do some damage - in a good way.